Since Canadian Confederation in 1867, there have been several proposals for new Canadian provinces and territories, with varying degrees of support and seriousness. 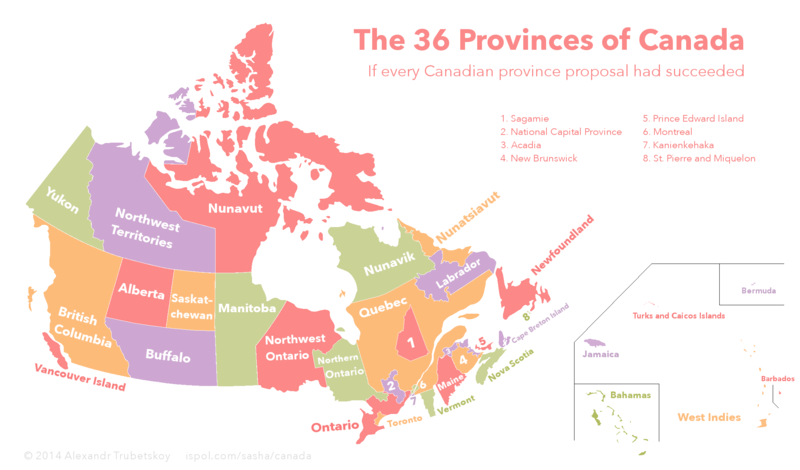 Included is every new province proposal since the late 19th century that gained any significant political support. Excluded is the rest of the United States (besides Maine, Vermont and the Northeast Angle), because those proposals were satirical. The three territories of Canada (Yukon, Northwest Territories and Nunavut) are included as provinces on the map, since there have been many proposals to make them full provinces. Many province proposals overlap, such as Northwestern Ontario and Northern Ontario. The map assumes that all overlapping proposals had succeeded, resulting in distinct provinces.